The table here give you a quick view to pick the right size. Baola is a unique Swiss ball created to add an element of artistic design to any office or room in the house. Limited Edition designed by British artist Mike Lemanski. Strong, double-stitched fabric – Your Baola is made to last. Soft touch, you will feel great sitting on it. Machine Washable – Your Baola will always shine. Made in Europe from A to Z. The artist behind the Orbit Edition. For the first edition of Baola, we worked with British artist Mike Lemanski to design a ball that would combine artistry and design with an otherwise very functional, therapeutic object. The result is the Orbit Edition by Baola, a Swiss ball that is unique and stylish. 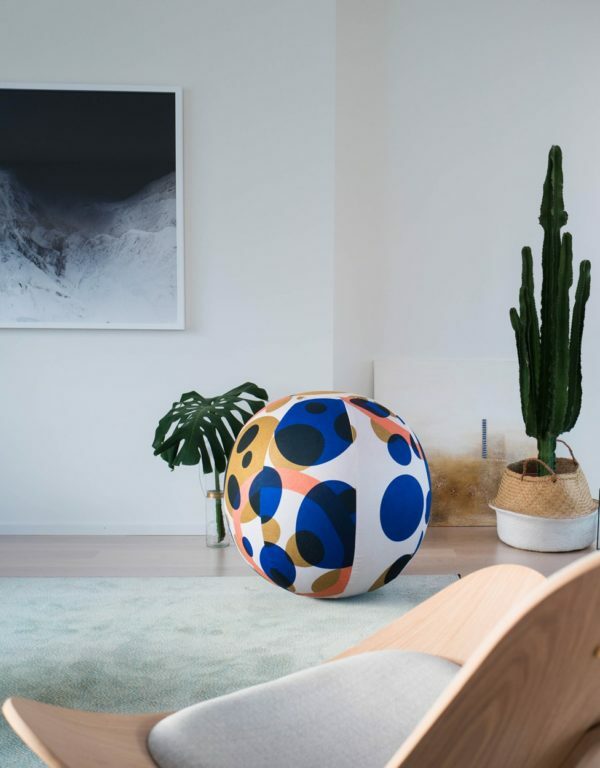 Mike Lemanski, artist and illustrator, comments: “I was really excited by the challenge of covering a Swiss ball with fabric to make it look beautiful, and bringing a design element to an otherwise quite functional piece of office furniture. Working with Baola provided a unique opportunity to express my art within a new medium. We have extensively researched the best and highest quality materials to create Baola. For our first edition, the Orbit Edition, we used a synthetic fabric for the cover. Baola products are meant to be used on floors, which get dirty. Synthetic fabric is very resistant to dirt. Also synthetic fabric doesn’t shrink when you wash it meaning a perfect fit even after washing. Because our covers are washable, they are long lasting and don’t need to be replaced so often, eliminating waste. Baola is proudly manufactured wholly in the EU, using materials and fabrics sourced from European textile artisans. Baola is made in Italy by a company that has been producing Swiss balls for over 50 years. For the fabric, we are working with an artisan in the Czech Republic. It is a small company that takes great care in the printing, cutting and sewing of our covers. A manual explaining how to get started with your Baola. What they say about their Baola. Care instructions and additional information. It is very easy to clean your Baola. Just remove the cover, close the zip and place the cover only in the washing machine at max. 40 degrees Celsius. The ball itself is not washable, should you need to clean it you can give it a wipe with a soft damp cloth.